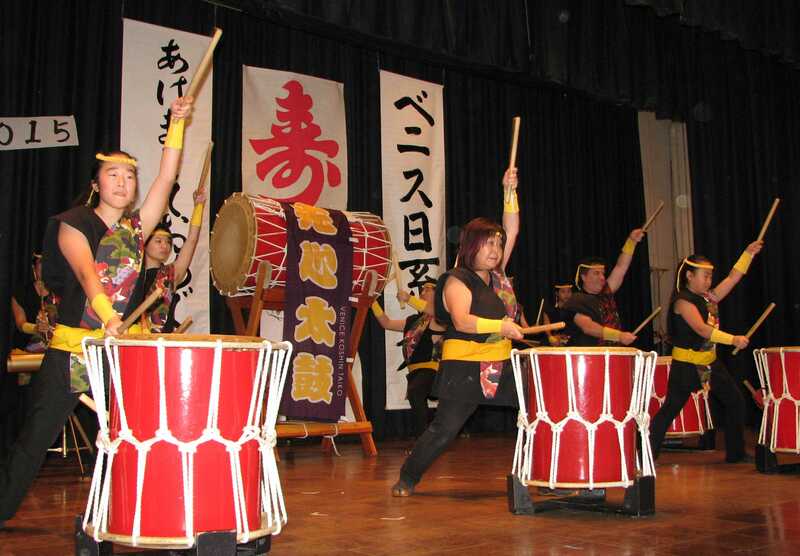 Koshin Taiko kicked off the program. 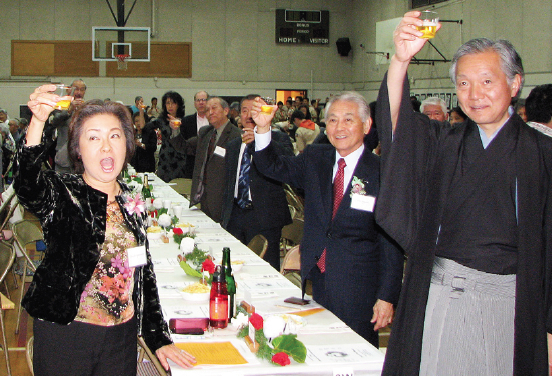 The Venice Japanese Community Center’s annual Shinnen Enkai/Keiro Kai, held Jan. 18 at the VJCC, featured the presentation of two community service awards and the first appearance by two dignitaries. 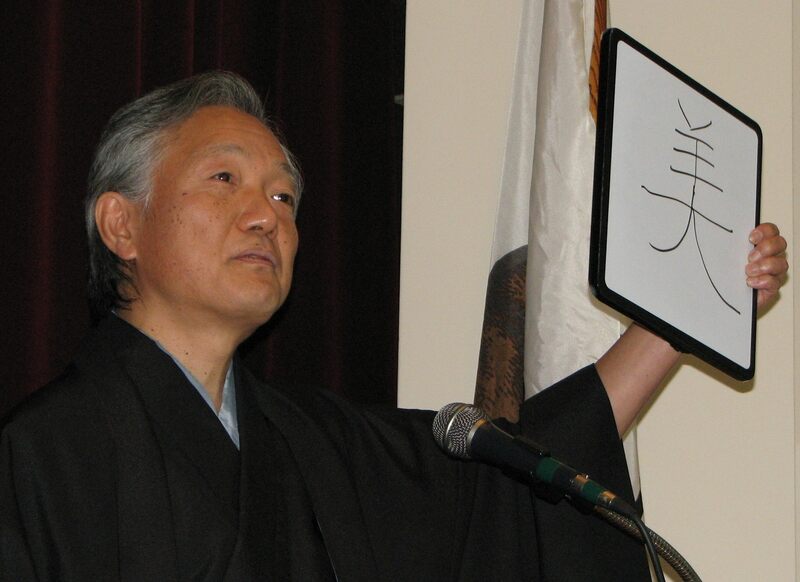 Consul General Harry Horinouchi showed how the kanji for “sheep” (hitsuji) can be changed into the kanji for “beautiful” (utsukushii). Emceed by Jeff Shimoyama, the “Year of the Sheep” program opened with drumming by Koshin Taiko, presentation of colors by Boy Scout Troop 764, shukugin, “Takara Bune,” by Kosui Yamamura of Kinyu Kai, and invocation by Rev. James Miyabe of Venice Santa Monica Free Methodist Church. 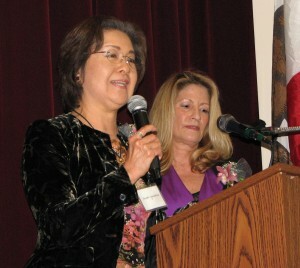 Entertainment co-emcees Fusako Ogasawara and Donna Burns. State Sen. Ben Allen, who was elected in November to succeed Ted Lieu (now a member of Congress), introduced himself. “I’ve been active with an organization called the United States-Japan Leadership Program, which tries to promote dialogue between our two nations, bring young leaders from both countries together, one summer in Japan, one summer in the United States … to try to strengthen this incredibly important relationship between our two countries,” he said. 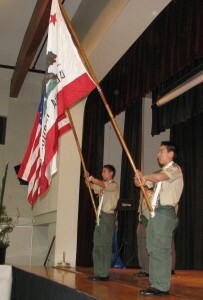 Boy Scout Troop 764 conducted the flag ceremony. Ashley Fumiko Dominguez, field representative for Lieu, gave a few remarks in Japanese, then said, “Congressman Lieu is very excited to be representing the 33rd Congressional District, containing very large pockets of Issei, Nisei and Sansei. As a Nisei, I am very honored to join this vibrant community. Dominguez announced that congressional certificates for the Keiro honorees will be presented at a later date. The Keiro honorees received gifts from VJCC and certificates from the State Senate and the City of Los Angeles. Kelsey Fung and Hope Hamamoto of Fujima Seiyumi Kai. 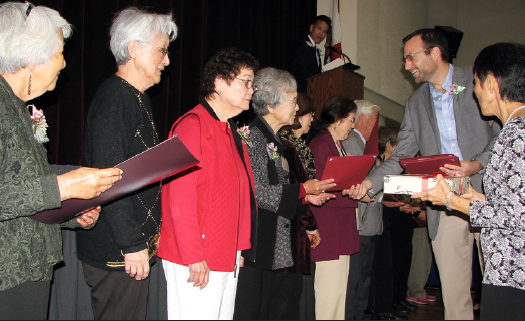 Certificates of recognition from the California Senate and the City of Los Angeles were presented to the following seniors: Geri Bieber, Art Haraga, Nancy Nakagama, Anne Nakama, Jean Nakamoto, Yoshie Nakao, Mariko Sekine, Helen Shishino, Mildred Tanaka and Yoshiko Yoshimori. Honorees not present were Celia Bocanegra, Misako Fujisaki, Haruko Inatomi, Frank Kawabe, Betty Kitabayashi, Barbara Matsuno, Allen Takakawa, Mieko Takigawa, Yaeko Tanaka and Misako Tanida. The VBJCC Person of the Year, Kazumi Ota, was announced by Vice President Jim Shibata: “As the volunteer managing editor of the VJCC Community News, Kazumi continues to give countless hours every month printing and overseeing and collating and stapling the newsletter … Even using the collating and printing machine, it takes hours to complete because of the volume. The newsletter averages about 30 pages every month, and the hard copies, about 1,300 of the newsletter is mailed each month. Ota, who was recovering from an illness, was unable to attend. Former Assemblymember George Nakano (right) installed the VJCC officers and board. 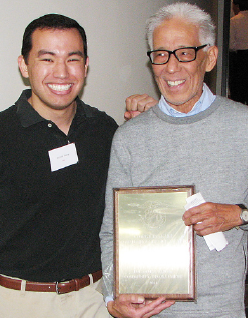 The George Inagaki Community Service Award recipient, Eric Inouye, was announced by Steven Sharp, president of Venice-Culver JACL. Sharp noted that Inouye grew up in the local community, graduated from Venice High School and USC, pursued a career as a pharmacist, and married his wife Elizabeth, with whom he has two children. Steven Sharp of Venice-Culver JACL and Venice Pioneer Project President Eric Inouye, this year’s recipient of the George Inagaki Community Service Award. Named in memory of George Inagaki, who was president of the Venice-Culver JACL, former president of the National JACL, and a community leader at the VJCC during the 1960s, the award is presented annually to an individual who has given his/her time and heart to the community. 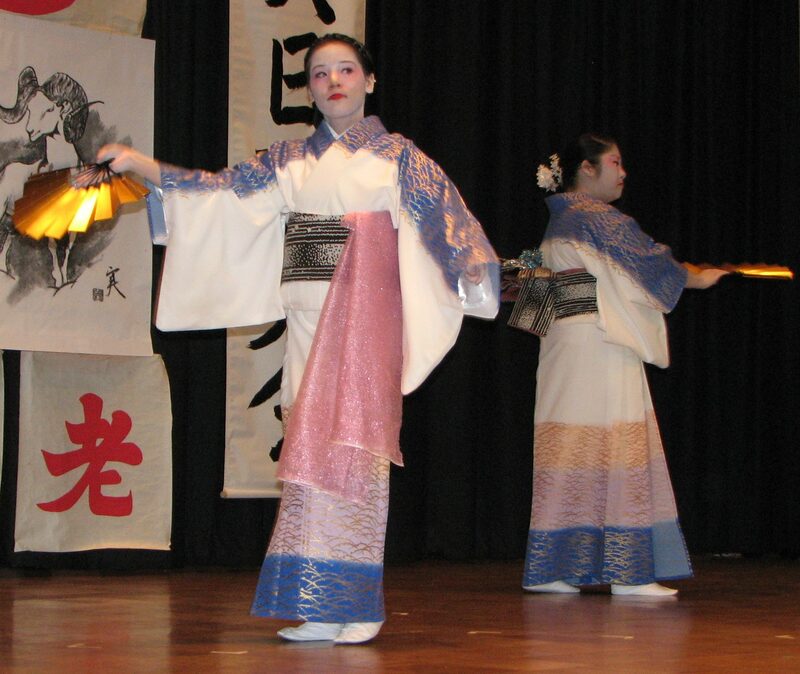 Classical Japanese dance by Fujima Ransei (Michiko Yamamoto). The cabinet consists of: Hiro Harada, president; Jim Shibata, executive vice president; Kelvin Uyeda, corporate secretary; Sharon Aratani, treasurer; Hitoshi Shimizu, auditor; and Fusako Ogasawara, membership. Other board members are Dave Hirota, John Ikegami, Eric Inouye, Kazie Kame, Jack Kurihara, Norm Matsubara, Ken Sogabe, Rich Yang and Ross Yasuda. The komon are Tad Suzuki, Jim Akioka, Kuni Nishiya, Robert Sawano and Hitoshi Shimizu. The kampai (toast) was led by Kuni Nishiya. Drawings for door prizes were overseen by Dave Hirota, with Nisei Week First Princess Lindsey Sugimoto, who represents West Los Angeles JACL and VJCC, selecting the winning tickets. The entertainment program, emceed by Donna Burns and Fusako Ogasawara, featured drumming by Koshin Taiko; hula dances by the VJCC hula class (Kumu Keali’i Ceballos, instructor); children’s songs by Venice Gakuen; classical Japanese dance by by Fujima Ransei (Michiko Yamamoto); Japanese dance by Fujima Seiyumi Kai; ukulele by Venice Hui Aikane, (Bob Matsunaga, instructor); and koto and shakuhachi music (Eiko Idota, instructor). 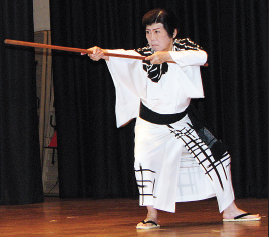 The event also included exhibits by Bunka Shodo Kai (calligraphy), Venice Gakuen (shuji kakizome/penmanship), Marina Bonsai Club, and Shunrei Uyeno (shochikubai, New Year’s arrangement with pine, bamboo and plum blossoms). Participants drank a non-alcoholic toast to the new year. 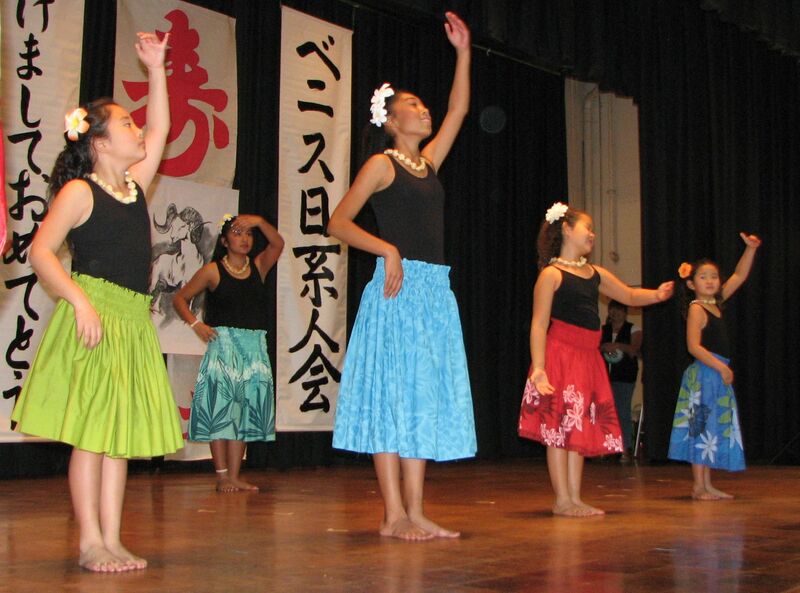 VJCC Hula Class, under the direction of Kumu Keali’i Ceballos. 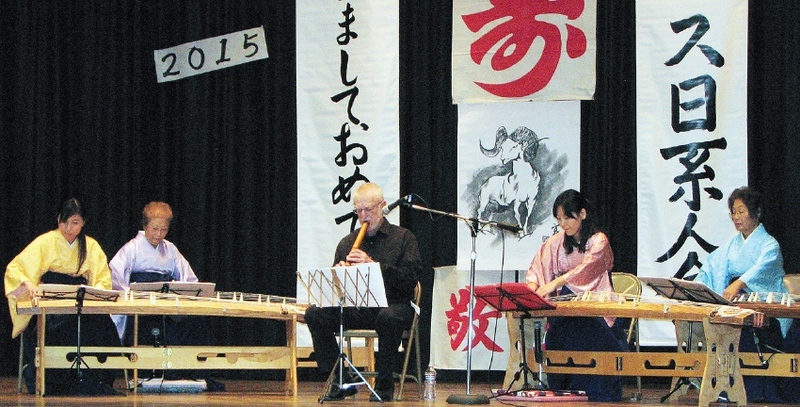 Koto and shakuhachi performance under the direction of Eiko Idota. Left: Students from Venice Gakuen. Right: Jeff Shimoyama, emcee, and Kuni Nishiya, who led the toast. From left: State Sen. Ben Allen, West L.A. Area Director Daniel Tamm (for Mayor Eric Garcetti), Field Representative Ashley Fumiko Dominguez (for Rep. Ted Lieu), Field Deputy Cecilia Castillo (for City Councilmember Mike Bonin). From left: VJCC President Hiro Harada; VJCC Vice President Jim Shibata, who announced the Person of the Year; 2014 Miss Western Los Angeles Queen Lindsey Sugimoto, who drew the winning tickets in the raffle. Ukulele performance by Venice Hui Akane, led by Bob Matsunaga.